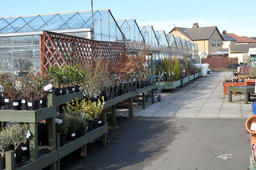 Business Description Is your "To Do" list of repairs round the home looking overwhelming and unmanageable? Where do you start and have you got time? 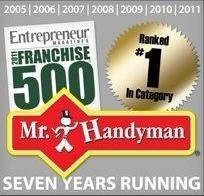 Instead, why not call your local Mr. Handyman to solve all your home and commercial repair headaches. Professional, safe, reliable handy man services on-time, every time, that's our guarantee. 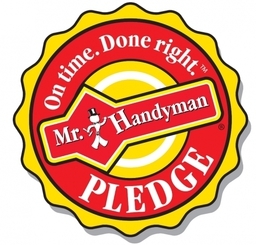 Mr. Handyman completes all major and minor home repairs in a quick, efficient manner. High quality, consistent work means every home repair, installation, maintenance or odd job is quickly checked off your â€œTo Do Listâ€ giving you peace of mind. 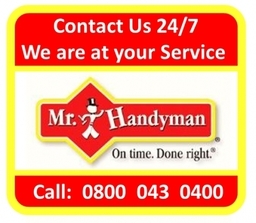 Mr. Handyman saves you time from the first phone call through to project completion. 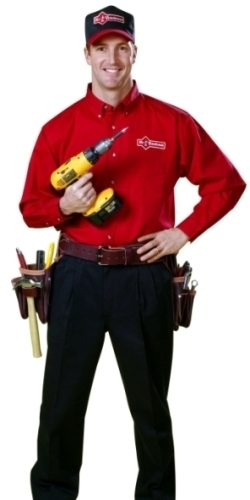 We complete jobs faster and better than your typical "handyman for hire." 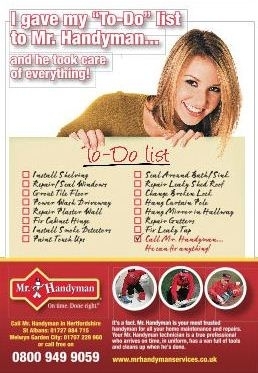 You won't have to interrupt your day, wasting valuable time waiting on Mr. Handyman. 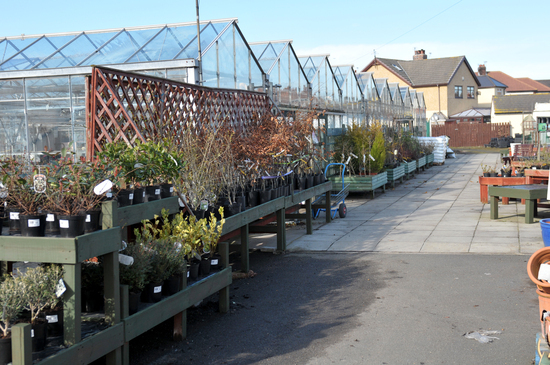 Our on-time record is second to none, and we arrive ready to work. 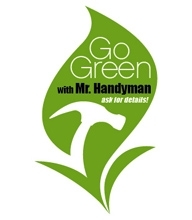 For all your major and minor home and light commercial repair needs, call Mr. Handyman today! 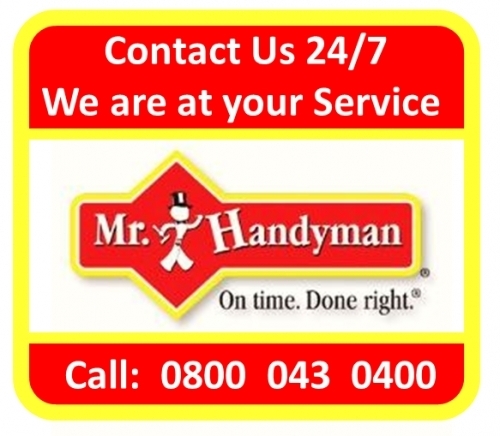 Services like Handyman service, plumber, carpenter, tiling, electrician, building work, joiner, leak, flat pack assemble, repair, professional, list, local, work, home, house, home repairs, property maintenance, property, gardening, garden maintenance, driveway cleaning, pressure washing, Handyman, odd job man, Painting , Decorating, gutter cleaning, cleaning , tidying. Less stress is just a few minutes away. 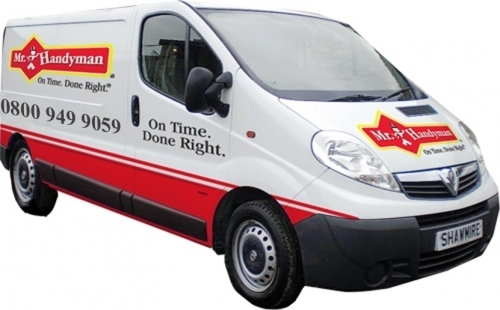 Professional, safe, reliable and on-time, every time, that's guaranteed. 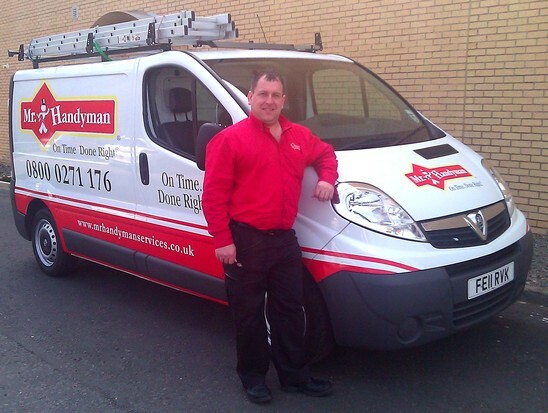 Our fully insured, qualified and smartly uniformed tradesmen who are all Disclosure Scotland checked will arrive on time, ready to work on your to-do-list. Carpenters and Plumbers - Kitchen supply and design Professional, safe, reliable and on-time, every time, that's our guarantee. Mr. Handyman services completes all major and minor home repairs in a quick, efficient manner, making your "To Do" list manageable allowing you to spend your time doing what you enjoy most. High quality, consistent work means every home repair, installation, maintenance or odd job is quickly checked off your list so you can officially get it off your mind.